Tonight I celebrated our ridiculously early spring with these tasty fresh spring rolls for friends! This is another common restaurant treat that can be easily reproduced in your own kitchen. The rolls were prepared in moistened rice paper (e.g., 22cm diameter, see video below for wrapping demonstration) with the following ingredients: napa cabbage greens, bean thread noodle (prepared in advance and cooled), cucumber (peeled, seed portion removed, and cut into roll-length spears), pea shoots (yay, pea shoots! ), julienne carrot, scallion greens, and shrimp (from frozen, sautéed with a bit of garlic salt, then cooled). The rolls were served topped with pea shoots, chopped peanut, and accompanied by a sauce of water, palm sugar (dissolved in the water over low heat), fish sauce, fresh lime juice, fresh minced garlic, and a chili garlic sauce to taste. I served these rolls (one per person) as an appetizer accompanying Rice Stick Noodle and Beef Sauté, however, this time I used more ginger, added strips of red onion, skipped the scrambled egg, and used palm sugar rather than honey. If you were to do make completely vegetarian rolls, I’d suggest replacing the shrimp with shelled edamame. 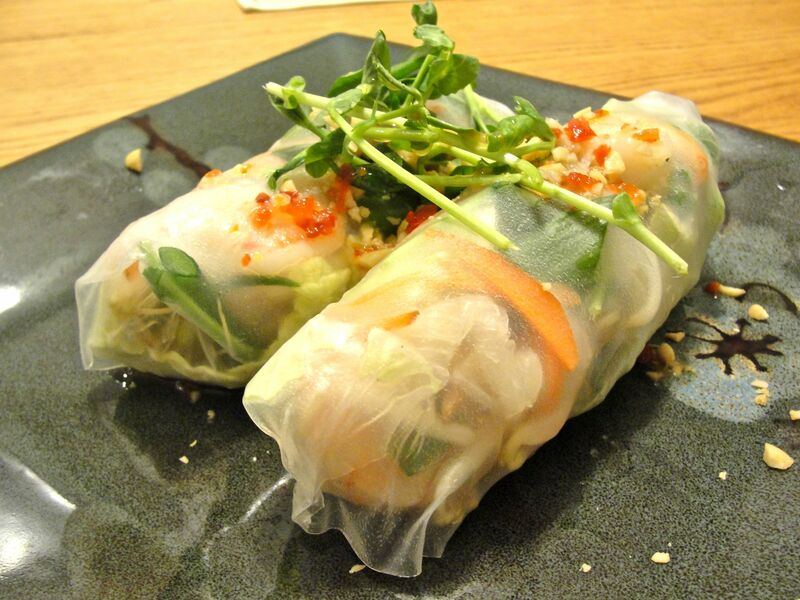 I’ve always wanted to try to make spring rolls….Now I’m going to!